Working grandparents will be allowed to take time off and share parental leave pay to help care for their grandchildren, the government has said. The plan would extend the current system, which allows parents to share leave and statutory parental pay. It was announced by Chancellor George Osborne as the Conservative conference began in Manchester. Labour's Harriet Harman had proposed a similar policy in a manifesto for women. Mr Osborne's plan involves extending the current system of shared parental leave - which allows a total of 52 weeks off - to cover grandparents as well as a child's mother and father. Families will also be allowed to split statutory shared parental pay - which is £139.58 a week or 90% of average weekly earnings, whichever is lower. The Conservatives say the policy will particularly benefit single mothers who, without a partner to share leave with, will now be able to do so with one of their child's grandparents. Mr Osborne also hopes the option will allow parents to return to work more quickly if they want to. He said more than half of mothers rely on grandparents for childcare when they first return to work after having a baby. He said: "Research shows two million grandparents have either given up a job, reduced their hours or taken time off work to look after their grandchildren. "Allowing them instead to share leave with their children will keep thousands more in the workplace, which is good for our economy." 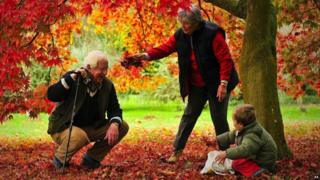 Video Childcare: Are grandparents entitled to flexible hours?